Some people are real car people – they worship their vehicles in ways that see them gift their machines human personalities and identities. Car people even give their cars names, akin to a pet, a friend, or a confidante. This connection to the automobile is part of a strange and beautiful symbiotic relationship we can develop with a pile of shaped metal and rubber, so it’s no wonder that cleaning, caring for, and storing our vehicles is a big part of the Canadian wintertime routine. When the sunlight and warmth returns in the spring, the ritual of unearthing our metallic friends is a time we all hope goes off without a hitch; store your vehicle properly, and you’ll be back on the road in spring without having to tune or overhaul your engine or fuel system. 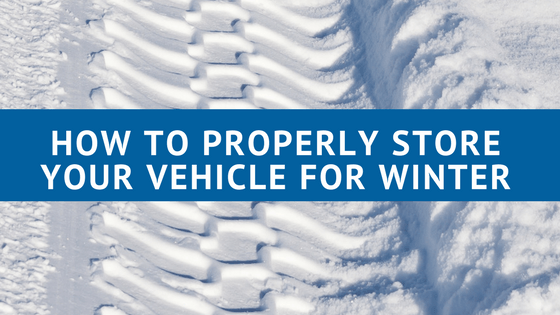 In this post, we’ll tell you everything you need to know about how to properly store your vehicle for winter. Where we choose to store our vehicles for the winter is just as important as how we choose to go about storing them. When considering where to store your summer ride, consider the climate and temperatures the winter will bring. For some of us, this can mean moisture and rain, for others it can mean bitter cold, snow and dry winds. The environments in which we choose to let our vehicles hibernate is an important choice so things like rust/corrosion, fuel system operation, and battery life are affected as little as possible. Always, regardless of your local climate, opt to store your vehicle in a clean, dry location that’s preferably temperature controlled. Being able to store your vehicle in a location free from excess moisture, cold, heat, and is well secured. For most people, this will mean a garage or a shop on their property, but there are innumerable storage facilities that specialize in wintering vehicles that you can explore if you don’t have access to your own storage space. Think of this process as a good, lengthy amount of time to say your seasonal goodbye’s. The preparation process required to store your vehicle for the winter will ensure that come spring time you’re ready to roll in as little time as possible. This means cleaning, detailing, and prepping some of your vehicles electrical and fuel systems for a long winter’s nap. We don’t just mean tidy out the change from your cup-holders – we mean a thorough and intense clean of your entire vehicle inside and out. The last thing you’ll want to do is leave the car is a less than pristine condition when the cover goes on for the last time for the season. Take the time to clean, disinfect, and tidy out any/all trash from your vehicle. Vacuum the seats, floor, and mats; apply a vinyl or leather protectant to the dash and doors; clean the windows inside and out, and give the exterior a solid clean and polish – wax too, if you can – before drying the surface of the vehicle. If you happen to have a damp garage as your storage location, and some bare metal places underneath the chassis of the vehicle, consider applying an undercoat to the metallic surface to stop any excess rusting from happening over the winter. A good spray of WD-40 will also do a good job, but make sure to refrain from spraying either compound on or near the exhaust system. When these systems expel heat in the spring, these products can prove flammable. When your wash is complete, your WD has been applied, and the trash has been taken out, cap off your exhaust pipe with either a rubber stopper, or a rolled up sock. Tiny critters like mice love to make winter homes in tight spaces like exhaust pipes and will clog and fill your system with bits of material to bed down in over the season. Inside the vehicle, you can also consider leaving some mothballs in a sock or two to discourage mice from setting up shop inside your vehicle. The smell in the spring is less than inviting, but it’s much better than finding dead mice and their droppings on your passenger seat. You can also take some time to set up a few mice traps underneath the vehicle, but remember for those of you storing your vehicle at home: mice and vermin poison is potentially hazardous to your pets, so proceed with caution. When putting your vehicle to sleep, it’ll be sitting idle for many months without moving so take the time to inflate your tires to their optimal recommended air pressure. Rubber is a naturally porous material, and tires will inevitably lose pressure over the course of the season thanks to temperature changes. This is also an excellent time to swap out a tire that you believe has a potential leak; a flat tire will mean that the weight of your vehicle will lean on the rim for an extended period – and that’s no good. Car collectors and serious car people will also consider placing jacks under all four corners of the chassis to help lift the weight of the vehicle off of the suspension components and tires – but this isn’t necessary. Think of this step as a bonus. Finally, don’t crank the parking or emergency brake when storing your vehicle, there’s a good chance it could become seized over the season. Instead, use some tire blockers or blocks of wood if you’re concerned about it rolling away. A standard tune up and or engine service is a good idea when putting the wheels away for the season. Top up all your fluids, and change your oil. Before putting it to bed, drive the car once more to circulate the new fluids through the entire system. Most petroleum and ethanol-blended fuels have a shelf life of about three months, so using a good quality fuel stabilizer (in a nearly full tank) is a good idea if you plan on leaving some fuel in the car over the winter. For those of you who opt out of a stabilizer, drive the car until there’s relatively no fuel left before storing it. Stabilizer will also help prevent fuel lines from rusting. Lastly, remove that battery. A battery that’s left in a vehicle will inevitably drain its power and you’ll be left with a dead car in the spring. Either disconnect and store, or connect your battery to tender/charger. This is particularly helpful info for those of you in cold climates – cold temperatures can crack and easily freeze batteries. The moment has come. You’ve cleaned the car from top to bottom, performed a mini tune up, changed your oil, and stuffed a sock in the exhaust pipe. It’s time to say goodbye. Invest in a good quality car cover to protect your vehicle from the elements over the season, even if that means the interior of your garage. This is also a good idea if you’re storing your vehicle in a publically owned storage facility. Better safe than sorry. As you cover her headlights for the last time, whisper your sweet nothings and remember the good times cruising around in the sunshine. The snow won’t last forever, and if you’ve taken these winter car storage tips seriously, you’ll be greeted by an eager and well prepped car in the spring.